This healthy cornbread will become an instant holiday classic! 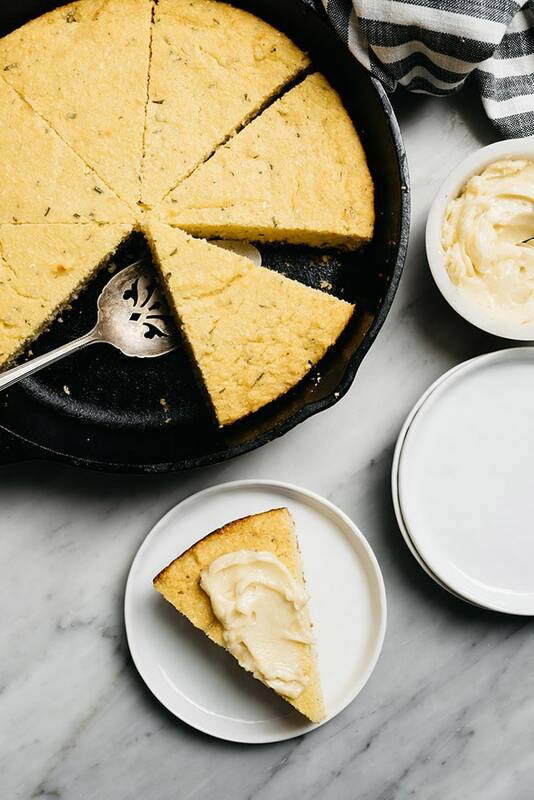 It packs all the texture and flavor of traditional cornbread, but kicks things up a notch with savory rosemary and sweet honey butter. >>> Pin it now! 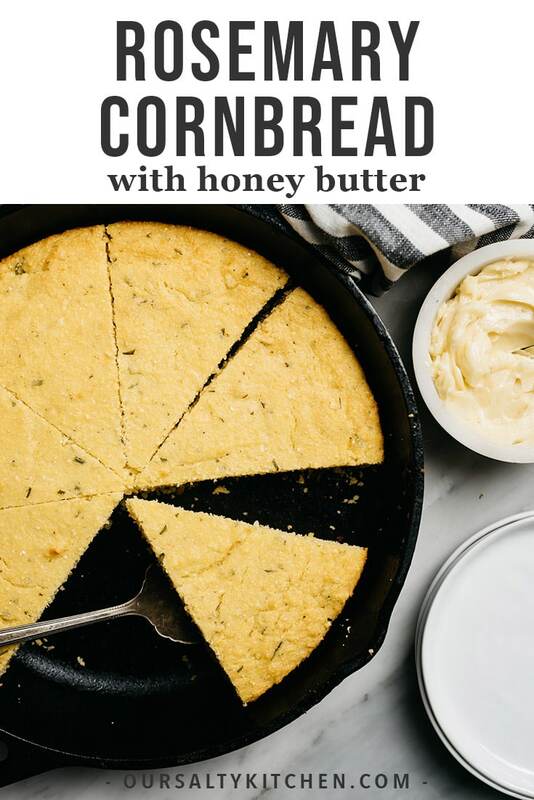 Click here to pin this Healthy Cornbread to your Thanksgiving Recipes board on Pinterest! It’s the final countdown friends! 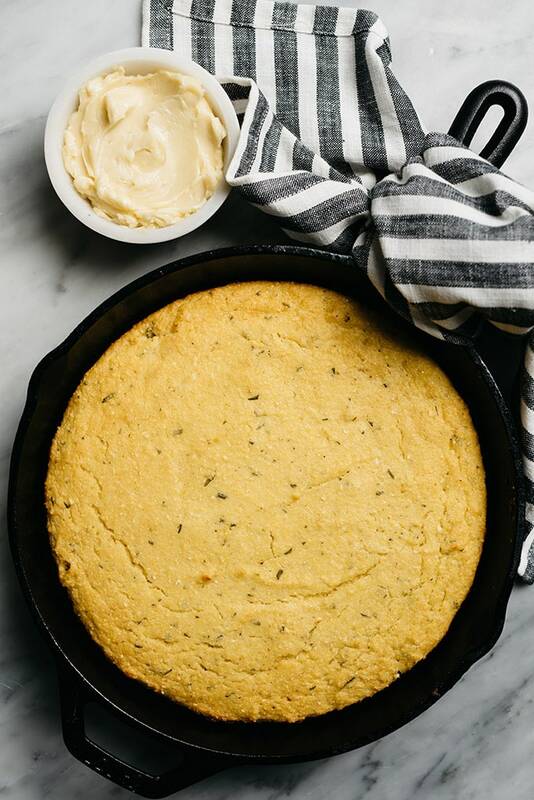 Thanksgiving is right around the corner, and this healthy cornbread with rosemary is exactly what you need to round out your spread. 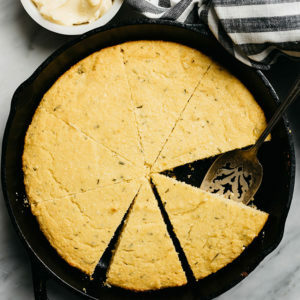 It has all the classic flavors of traditional cornbread, but with a bright, fresh, and earthy twist from fresh rosemary. Kick it up a notch with homemade honey butter and you’ve got an instant classic on your hands. What Makes this Cornbread Recipe Healthy? Let’s be honest here – traditional cornbread with butter and sugar is totes delicious. 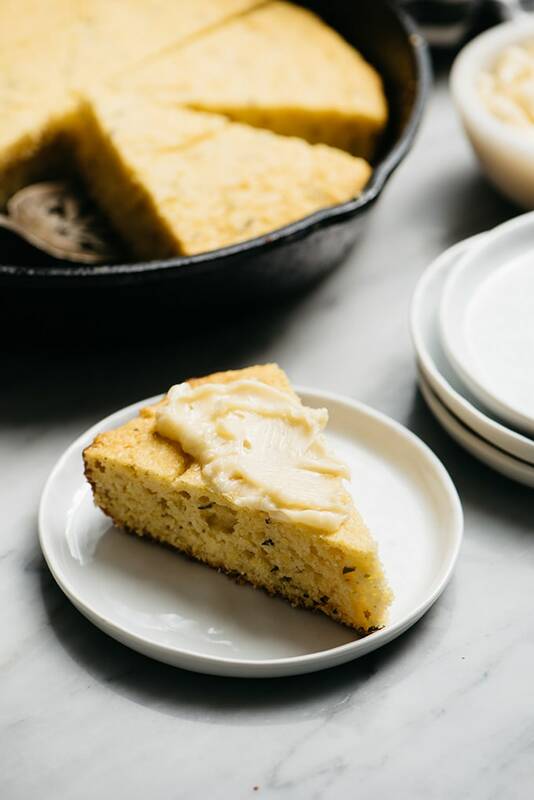 But if you’re like me and you want to keep your side dishes on the healthier side so you can indulge to your heart’s content at the dessert table, then this healthy(er) cornbread is the recipe for you! Honey and greek yogurt give this healthy cornbread recipe that classic sweet and tart flavor. Fresh rosemary perfectly compliments those flavors, and keeps this recipe both fresh and interesting. 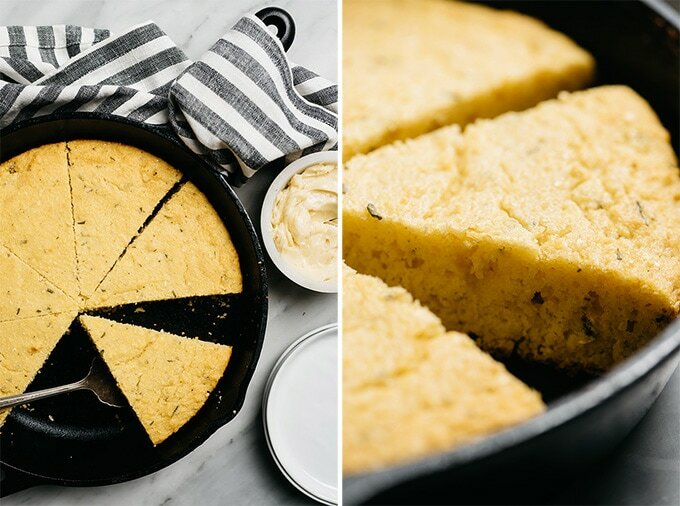 Bake the cornbread in a preheated cast iron skillet for the ultimate crispy crust. This cornbread recipe is a snap to prepare. To achieve the crispiest crust possible, start by preheating the cast iron skillet in the oven. This will help the crust form immediately as soon as you transfer the batter to the oven. To prepare the batter, thoroughly whisk together the dry ingredients – cornmeal, flour, baking powder, salt, and chopped fresh rosemary. Chop the rosemary on the finer side for best flavor and texture. Then whisk together the wet ingredients – yogurt, eggs, olive oil, and honey. It’ll seem thick at first, but once you work the eggs in it becomes pourable. Pour the wet ingredients into the dry ingredients, and then fold the batter together until it’s just barely combined. The batter is on the thicker side. Using an oven mitt, remove the skillet from the oven and lightly grease with about a tablespoon of olive oil. Pour the batter into the preheated skillet, smooth out the top with your spatula, then transfer back to the oven. Bake at 375°F for 20-25 minutes, until the cornbread is golden brown and a toothpick inserted into the center comes out clean. As my 2-year old is fond of saying: TA-DA! Crispy on the outside, moist and tender on the inside, healthy rosemary cornbread. While the cornbread is baking, I highly encourage you to whip up some honey butter. Simply add one stick of softened butter, two tablespoons of honey, and a quarter teaspoon of vanilla to a bowl and mix with a hand-mixer until fluffy and shiny. It’s DELICIOUS. Some might say it kinda defeats the purpose of “healthy” cornbread, but you only need a little. 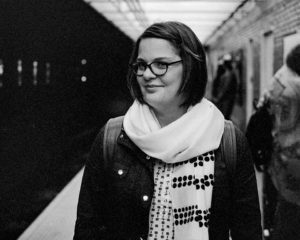 It’s the holidays – be bold! Make it cleaner: use half a cup of whole wheat flour instead of white flour, and increase the olive oil to 1/3 cup. The color will be more deeply golden brown. Make it gluten free: use gluten free flour instead of wheat flour. I tried this with Bob’s Red Mill Gluten Free All Purpose Baking Flour and it turned out wonderfully. Use different herbs: try sage, thyme, or basil. 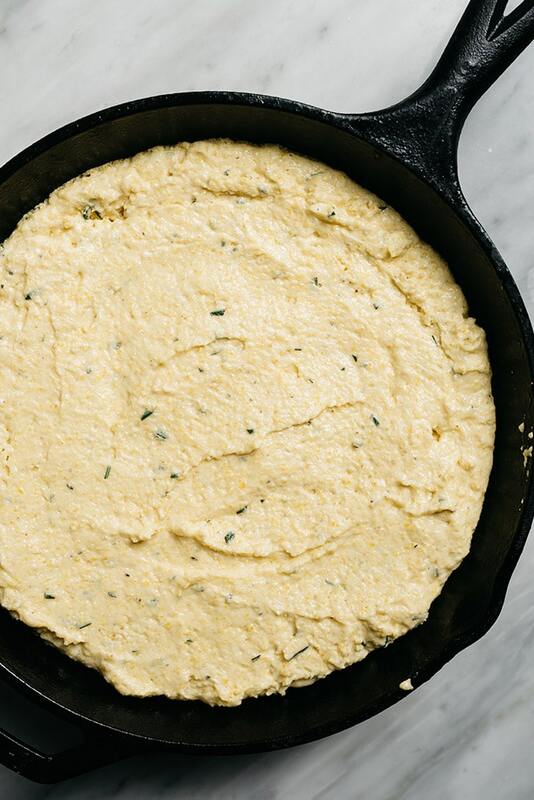 DID YOU MAKE THIS HEALTHY CORNBREAD RECIPE? I WANT TO SEE YOUR CREATIONS! SNAP A PICTURE AND SHARE IT HERE ON PINTEREST. Honey and greek yogurt give this healthy cornbread recipe it's sweet, tart flavor. Fresh rosemary perfectly compliments those flavors, and keeps this recipe both fresh and interesting. 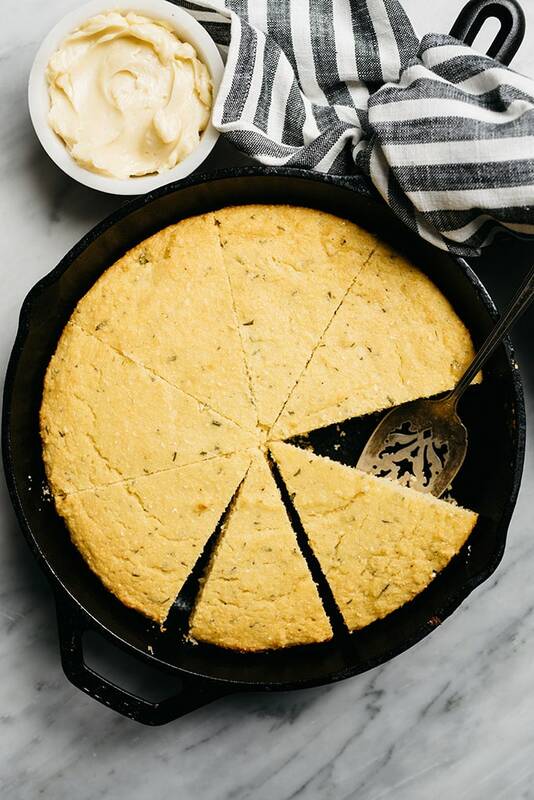 Bake the cornbread in a preheated cast iron skillet for the ultimate crispy crust. Place a 10” cast iron skillet in the oven on a rack positioned in the center of the oven. Heat to 375°F. Whisk together the cornmeal, flour, rosemary, baking soda, and salt. In a separate bowl, whisk together the greek yogurt, eggs, olive oil, and honey. Pour the wet ingredients into the dry ingredients, then fold together until just barely combined. Using an oven mitt, remove the cast iron skillet from the oven. Add the remaining tablespoon of olive oil to the skillet, then either swirl or use a pastry brush to coat the pan with the oil. Pour the batter into the greased skillet and smooth the top using the spatula. Return the skillet to the oven and bake until golden brown, and a toothpick inserted into the center comes out clean, 20-25 minutes. Remove from the oven and cool in the pan 10 minutes. While the cornbread is baking, prepare the honey butter. Place the butter, honey, and vanilla extract into a mixing bowl or the bowl of a stand mixer. Beat the ingredients until the butter is smooth and shiny, about 2 minutes. Slice the cornbread into 8 wedges and serve with the honey butter. Leftover cornbread keeps in a sealed bag or container at room temperature for up to three days. Leftover honey butter keeps in the fridge in a sealed container for up to 1 month. Nutritional information reflects one slice of cornbread served with 1/2 tablespoon of honey butter.